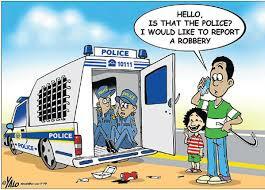 “Dear Bruce, What happens with SAPS, is you go to the charge office in the vicinity of where the crime took place. I say we can easily go to SAPS Sea Point, because she carried out the crime from your premises’ server. You then wait for an interview with a cop. You will then explain what happened to the cop, who will stare at you like you are some original Aboriginal human-game-hunting expert, and he/she will then start mumbling, scratching his/her head, yawning, playing with WhatsApp and calls being constantly received for outstanding township loan-shark overdue loans, while attempting to ask complicated questions with big words such as “run”, “climb” and “jump”, and he/she will then proceed to write down a statement using a soft-up-hard-down cursive writing technique, employing a crayon, or a piece of charcoal, as a writing implement. Hours later, you may have something that resembles an affidavit in the most unintelligible English. Then you may get a case # and then be assigned an investigating officer. No investigation will most likely ever take place, other than the suspect being called by SAPS and the suspect lying about what she did, and the SAPS docket then being handed to the Senior Public Prosecutor, who will refuse point-blank to prosecute, because the SAPS docket resembles an 8-year old remedial school special needs’ child’s homework. If you believe in miracles, and perhaps in the 2, 000 year old power of John the Baptist, you might one day get to Court after a warning statement is issued to the suspect to appear before Court. The matter will then drag on for months, just for her to get a lawyer, and then if a trial is ever run, a year or two later, she may perhaps get, at most, a fine and/or a suspended sentence. The level of lower court prosecutors has improved, but a half-decent lawyer with questionable ethics, a drink/drug addiction, very mediocre performance skills and below average legal ability, could in all likelihood get her off scot-free. All the above will take probably a hundred and fifty to two hundred hours, or more, off your life. That equates to more than ten whole days down the toilet, where you could rather be doing much better things like – watching ENCA news and laughing at various VBS Bank account holders lie about how they had no cause for concern, when an amount of R 300m mysteriously arrived in their savings account, with absolutely no legal basis whatsoever for the transaction. So, I ask you, will it be worth it? Bruce, my final legal advice is – go straight to the boozer right now, and order five cases of XXXX lager mate, start drinking rapidly, and FORGET ABOUT IT. Thanks for the compliment, I will pass it on to Barry.